How weird would it be if my new favorite pizza included something GREEN? I mean, usually I wax poetic (HA) about how I am the most boring-est pizza eater on the planet, forcing any and all around me to order their delivery box completely PLAIN with just cheese because toppings are for fools. Okay not really. Toppings are for cool people, I of which am not one. Whipped ricotta. You could probably do whipped feta if you’re feeling frisky. THAT would be wild. It’s really such a SIMPLE pizza but it tastes incredible. I use the chili garlic paste again on the kale (oh man are you so sick of that yet?) and then some fontina cheese so this is totally just a mash up of some things I adore. Truth. But together… whoa whoa whoa. Ridiculous. The kale also gets crispy in places which I freak over. That’s the one way that I truly love kale – like, actually LOVE it. Raw kale salad? Meh. It’s okay. Better with fried chicken. But most raw kale salads? I’m just like… do less. This year I’m going to resolve to try to have a FEW extra things on my pizza, if only because it gives me another vehicle to get in some veggies. And another excuse to eat pizza. Because if I’m going to have vegetables for dinner, well, then… I’ll just make pizza. See? I win. Chop the kale into slices and shreds with your knife, then place it in a bowl. Add the olive oil, honey and chili garlic paste then toss well to coat. Massage with your hands for 2 to 3 minutes, then let it sit until ready to use. Add the ricotta to a food processor and blend until it’s smooth and creamy. Add in the cheese, salt and pepper, pureeing again until combined. Brush the pizza dough with the olive oil. Spread 1/2 of the whipped ricotta on the dough, leaving a 1/2-inch at the edge of the crust. Cover the ricotta with the shredded kale, then add scoops of the leftover ricotta on top of the kale randomly. Sprinkle the fontina on top. Bake for 25 to 30 minute (or a little less if using the stone) or until the cheese is golden and bubbly. Remove and let cool slightly before serving. Top with the extra parmigiano-regianno and crushed red pepper flakes. We made this tonight with garden grown kale. It was AMAZING! What a wonderful recipe. Didn’t have any chili galic paste on hand, so we massaged the kale with garlic, olive oil, chili flakes, and a little salt. Yum! After having this window open on my laptop for far too long, I finally made this pizza for dinner last night, and it was AMAZING! Easily the top 3 pizzas I’ve ever had. 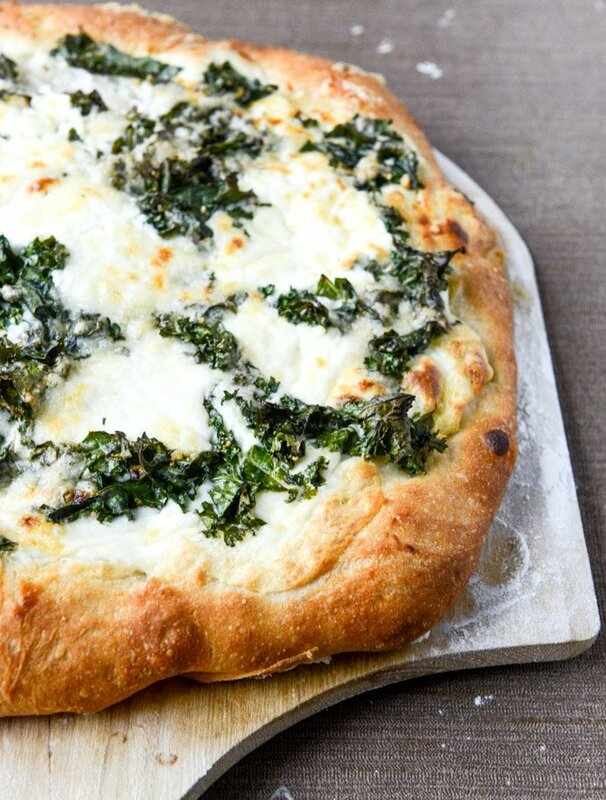 The combination of crispy sweet, spicy kale and creamy ricotta makes me want to sing! Go you for creating this!!! Made this tonight and it is absolutely amazing!!! 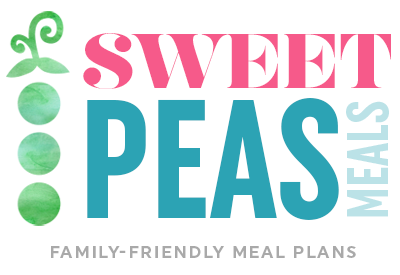 I love your blog and your fantastic recipes. I made your ginger garlic steak tacos with pineapple pico last night and they were delicious. Hands down, the best vegetarian pizza ever. I am converting my friends one by one in the Caribbean. 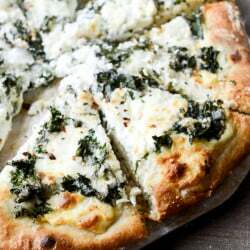 I have made it countless since discovering this recipe except I use a store bought thin crust and a herb blend of parsley, garlic, paprika on the kale. 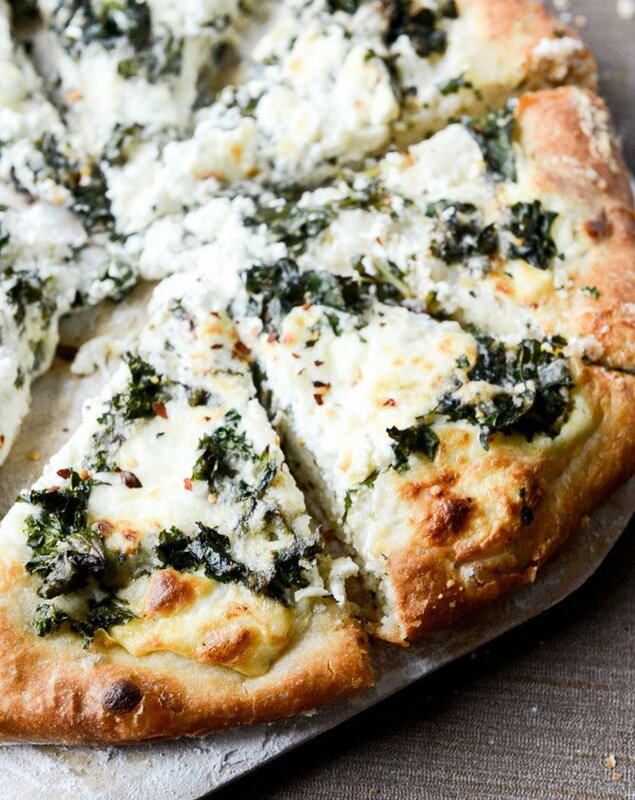 I just make some homemade ricotta (which is amazingly easy) and can’t wait to use it in this pizza!! How is whipped ricotta different than just putting the ricotta on the pizza? Is it worth dirtying a food processor? it depends on if you like the texture of ricotta. it sort of resembles cottage cheese, so whipped it makes it smooth and creamy! Made this last night. While the flavor was out of this world, the crust was really really soggy. Like when we put the pizza on our plates, liquid was pooling around it. Any ideas as to how I can prevent this next time? I used sweet garlic chili sauce because I’m lazy and it seemed a good approximation of siracha and honey and I used chard. This was fantastic and soooo simple. Total keeper. Made this tonight and it was incredible! My daughter found the recipe and begged me to make it. I’m so glad I listened to her! I only had Chili Garlic Sauce, not the paste, so I used that and it was perfect! I also used a Trader Joe’s crust because I was short on time.